HONG KONG, 17 January 2019 – A survey conducted by Chubb of Small and Medium Enterprises (SMEs) in Hong Kong has revealed a significant perception gap in cyber awareness among Hong Kong SMEs and how well they are prepared to deal with it. Half the respondents (52%) in Hong Kong believe they are less vulnerable to cyber incidents than their larger competitors; yet 71% of SMEs in Hong Kong have experienced a cyber error or cyber attack in the last 12 months. The findings also show that majority of cyber incidents which occurred over the past year were mainly due to internal factors, such as data loss through system malfunction or technical fault (28%), business interruption from system malfunction or technical fault (26%), and human error causing business interruption or data loss (22%). “Some SMEs believe they are too small to be targeted by cyber criminals or any internal issues will not greatly impact them. In effect, they think they are “too small to fail”. 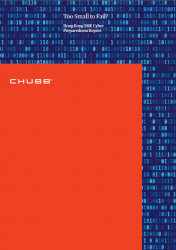 However, our own claims data highlights numerous small business compromises and ransomware events that are decimating the cash flow of small businesses,” said Andrew Taylor, Cyber Underwriting Manager, Chubb Asia Pacific. Overconfidence in managing a cyber incident? 52% believe they are not aware of all the cyber threats they face. 21% of SMEs who experienced cyber incidents did not know which data files were affected. The survey also uncovered a lack of understanding of cyber insurance with 49% of SMEs in Hong Kong not fully understanding the insurance solutions available while 53% have never purchased cyber insurance before.